Use unified logs and metrics to improve security posture, monitor WAF activity, and measure quality of service for your CDN end users. Track user behavior and spot patterns of suspicious activity before they affect your applications or impact the user experience. Get up and running in minutes with preconfigured searches and dashboards that help you make sense of Fastly logs. Content Delivery Networks, or CDNs, allow enterprises to distribute content to data centers and other locations around the world without exhausting enterprise resources. Instead of spinning up servers and managing complex application infrastructure, companies can take advantage of the Fastly CDN to deliver faster, more reliable sites. But since Fastly serves such a large amount of traffic on behalf of their customers, analyzing Fastly logs is crucial to getting real-time data about website performance and security. The Sumo Logic App for Fastly gives you the power to analyze and correlate Fastly data with origin data to monitor applications, spot patterns, and improve security. The Sumo Logic App for Fastly helps ensure optimal CDN performance for your websites and applications. 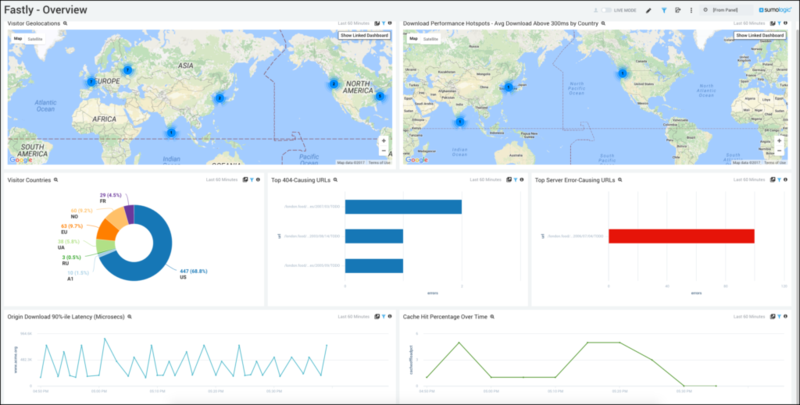 With simple setup and prebuilt dashboards, you can spend time analyzing trends and patterns—not digging for nuggets of information in different log files. Collecting Fastly CDN logs with Sumo Logic is simple. Simply add a Hosted Collector within Sumo Logic, configure an HTTP source for your Fastly data, and select a few more settings to start ingesting Fastly logs. Once your logs are flowing into Sumo Logic, you can use premade dashboards to get a unified view of Fastly activity and long-term trends. Try the full Sumo Logic experience free for 30 days! Watch the Sumo Logic webinar to learn more about implementing and maintaining a DevSecOps approach for cloud applications. Overview: Visitor geolocations, download performance hotspots, visitor countries, top 404-causing urls, top server error-causing urls, and more. Origin Performance: 90%-ile latency by origin host, median latency by origin host, slowest urls, origin content download time, and more. Sumo Logic's advanced analytics help you contextualize and correlate logs and time-series metrics, giving you the tools you need to find the needle in the haystack.